We can ... examine our own biases and assumptions, especially in working through difficult conversations. Minds much more acute than mine have no doubt examined the notion that we as a species may well be the only creatures on the planet to ask questions. Other primates laugh and make inferences about events around them, just like we humans do, but which other sentient beings actually formulate a question with the intention of learning from the response? That possible differentiator aside, the question is perhaps our most powerful tool in exploring both our inner and our social lives. In my past life as first a criminal courts journalist and then as a freelance investigative journalist for the CBC (Canadian Broadcasting Corp.), I relearned something my Jesuit-trained logician father taught me: that the ability to ask the one right question is a compelling competitive advantage. Why? Because our ability to discover the rudiments of navigating the physical world stands or falls on our ability to form inferences from the answers we receive. More deeply, human interactions hang on the questions that encourage us to consider intimacy, anger, risk, or recollection. Perhaps the most infamous political assertion ever—Vladimir Lenin’s “Who, whom?” (in Russian, “Kto kovo?”)—is a masterpiece of succinctness. It’s also a question. We live in a time when even agreeing on the substance of reality is in play; perhaps—thinking back on mass media in the 20th century—life has always been this way. With that in mind, here’s a story about post-traumatic stress disorder (PTSD), politics, and the “how” of asking the one right question. Between 1993 and 1997, I visited Fidel Castro’s Cuba a dozen times. My first assignment involved finding and interviewing Ernest Hemingway’s bartender from El Floridita, Antonio Meilan. My colleague, photographer Russell Monk, and I tracked the grand old man down and sold our story to magazines all over the place. I still have Meilan’s handwritten recipe for “la papa doble,” the over-proof double daiquiri Hemingway famously imbibed at his corner bar stool, then reordered, taking a second (or a third) “for the road” with him in a stainless steel thermos. Meilan liked Hemingway, but warned me that some Cubans who frequented El Floridita didn’t, referring to the expatriate writer with an unprintable but very Cuban epithet. I’d flown to Cuba with Helga Stephenson, a Canadian woman of considerable force (she was one of the co-founders of the Toronto International Film Festival) who knew Cuba like the back of her hand. Her suggestions for great Cuban stories always won Monk and me ink—but one would change my life. Stephenson introduced me to Lionel Martin, the Reuters bureau chief in Havana, a thoughtful old journalist who’d never left the island. He just kept reporting, filing hundreds of stories datelined Havana over the decades since the 1959 revolution. Through Martin, I met an extraordinary woman (who shall remain nameless), who introduced me to people at the heart of the then-embryonic Cuban dissident movement: the underground journalists. That tip, shared in the back of the old, red, Russian-made Lada sedan that served as my office, far from eavesdroppers and wiretappers, set in motion a yearlong quest to find and interview as many Cuban dissidents as I could. The work turned out to be remarkably easy, as Havana residents had a kind of “bush telegraph”—a superfast “social network” a decade before Facebook or Twitter. The Cubans call this gossip network “chismoso.” At sunset, the women of Havana simply call from one balcony to the other, sharing the news of the day. 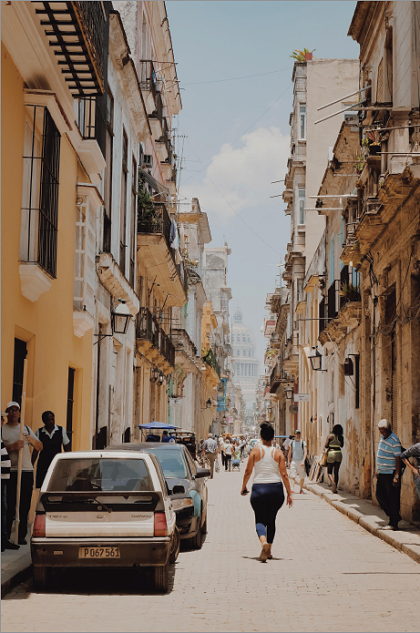 If you’re on the street below on the right evening and can understand the blurry-fast, half-mumbled Cuban Spanish they themselves call “mashed potatoes,” it’s like it’s raining gossip. These women—a few of them—shared their telephones for collect calls to Miami or Mexico City over the antiquated Cuban phone system, so the reporters could never be pinpointed to a single phone line. There had long been rumors that the criminal pavilions (wards) of the Mazorra, Havana’s psychiatric hospital, had been used to incarcerate perfectly sane but politically suspect people among the most violently dangerous prisoners on the island. In the 1970s, the U.S. Congress heard harrowing tales of what Castro himself termed, when he first saw Mazorra in 1959, “Dante’s Inferno”—a hell on earth. Thirty-eight years later, in 1997, one Cuban investigative journalist among the dissident reporters I’d been introduced to was exiled to Miami. In the meantime, I’d been researching specialists treating PTSD in people who’d witnessed the horrors of the round-robin of civil wars in the former Yugoslavia. That’s how I met Jack Saul, who was then running the Belle-vue/NYU Program for Survivors of Torture, which was the only outpatient program in the world for victims of political torture. Thoughtful, open, and generous, Saul took me to lunch at an Argentinian restaurant in the West Village. “How do I ask torture victims about their experiences?” I asked. Saul had by this time seen hundreds of patients: Cubans, Azerbaijanis, Kurds, Iranians, Ugandans, Palestinians, Russians, Serbs, Croats, Iraqis, and more. His patient lists read like an inventory of the planet’s political nightmares, of terror states such as Idi Amin’s Uganda and Saddam Hussein’s Iraq and religious persecutions of all stripes. “Here’s what you need to know,” he replied. “These people don’t want your sympathy or your condolences.” I remember him saying that what they want is respect. “None of us can imagine the suffering these people have endured. It’s a foreign country to us. What they want, most of all, it seems to me, is their dignity.” I took this to mean that these people, who have endured so much suffering, want to live their lives on their own terms. They want to matter. That’s the contract for healing they have with themselves, I thought. “What they want isn’t to be understood or pitied,” Saul said. “First and foremost, you must never, in the process of eliciting their story, re-traumatize them.” PTSD was almost universal among the patients Saul and his team treated. The prospect of inducing a Cuban who’d been subjected to the sheer terror of being the sole sane person in a ward full of violent prisoners to relive his or her experience suddenly struck me as predatory. “It doesn’t have to be,” I recall Saul responding. The ethical issue was that I as a journalist had a moral duty to share a vitally important human rights story simply because I knew it—but I had to weigh that imperative with asking questions of PTSD-afflicted people from a different culture so that they didn’t relive their experiences. That question, clumsy though it was, never let me down. In the course of the half-dozen sensitive interviews I did—including one in a Toronto GP’s office through a half-closed door with a Cuban soldier who was incarcerated in a military psychiatric prison for “political unreliability”—I realized a working truth. We cannot empathize beyond our own frame of reference. We can, however, examine our own biases and assumptions, especially in working through difficult conversations. We can acknowledge and act on those. It’s then, paradoxically, as I discovered when I interviewed the last Cuban journalist (of whom I’m aware) who was subjected to the terrors of Mazorra, that you must “see the other,” the vulnerability of another human being. That’s the power of the one right question.